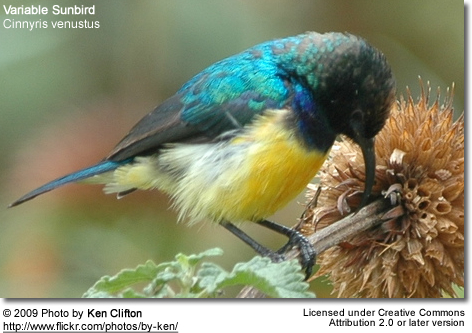 The Variable Sunbird, Cinnyris venustus (formerly Nectarinia venusta), is a sunbird found in equatorial Africa, where they are fairly common in open woodland and cultivation. They feed largely on nectar - most species can take nectar by hovering like a hummingbird, but they usually perch to feed. They will also take insects, particularly when raising young. The average clutch size consists of two eggs that are laid in anest suspended in a tree. 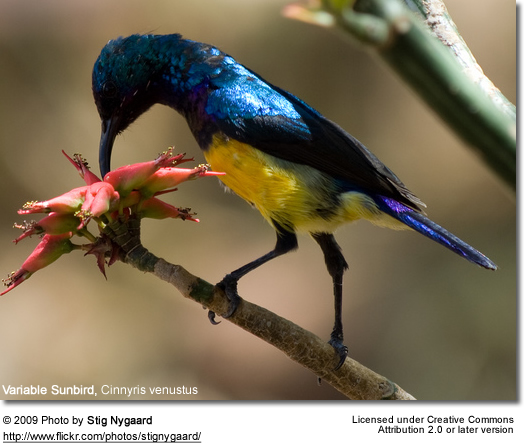 Variable Sunbirds are small, only 10 cm or 4 inches long. They have medium-length thin down-curved bills and brush-tipped tubular tongues - both adaptations for nectar feeding. The adult male has a glossy green head, throat and nape with maroon chest band and a yellowish belly. The female has grey-brown upperparts and yellowish underparts, and an obvious pale supercilium (line above eye). The eclipse male is like the female, but shows some green, especially on the throat. Flight is fast and direct on their short wings. Its call is a clear tew-tew-tew-tew-tew .